In today’s Gospel Our Lord tells the disciples that starting from Jerusalem they would be witnesses that repentance would be preached, for the forgiveness of sins, and this preaching would then extend to all the nations. Peter in today’s First Reading takes up this thread as the Jews gathered in the Temple are still astonished by the healing of the man crippled from birth. Peter starts preaching in Jerusalem, but he tells the Israelites that this preaching is meant to become a blessing for all. Peter speaks to his audience in a language they understand: Biblical tradition and fulfillment. He shows them that the God of their fathers, the patriarchs, raised Jesus from the dead after they’d put him to death out of ignorance. The healing of the crippled man in Jesus’ name was a sign of this. Moses in the book of Deuteronomy, quoted by Peter (Deuteronomy 18:15–16), had promised them a prophet would come who was indispensable for remaining a part of the People of God and would be like Moses himself. That prophet was Jesus. Peter tells them all the prophets had announced what was taking place. Therefore this was an essential moment of fulfillment for the people of Israel: through this moment the people of Israel will fulfill their purpose, a purpose mentioned to Abraham that through them all families of the earth would be blessed (see Genesis 12:3). Peter encourages them to repent of what they’d done to Jesus and to believe in him. In each believer preaching repentance for the forgiveness of sins starts with us: we have repented and received this forgiveness, we have believed in Jesus after letting him be handed over. Like the first disciples we must proclaim the good news as well so that every nation will be blessed. The good news has reached us; let’s help it reach others. Readings: Acts 3:11–26; Psalm 8:2ab, 5–9; Luke 24:35–48. See also Easter Thursday and 3rd Sunday of Easter. Today’s readings remind us that the Risen Lord does not just exceed our expectations; he transforms them. The crippled man in today’s First Reading was just expecting another handout from Peter and John, another moment in a lifetime of begging. In Jesus’ name he receives something that transforms his life: the ability to walk after being crippled from birth. He expected God to be good to him, but not to give him a new life. He knows where credit is due: as he enters the Temple area for everyone to see he praises God, and the very fact that he was walking astounds the people who knew him before. 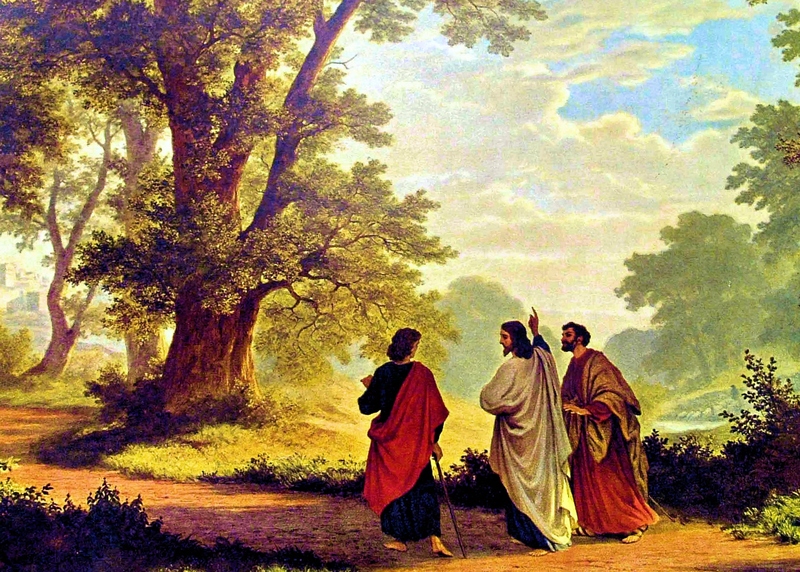 The disciples on the way to Emmaus in today’s Gospel expected Our Lord to be more than a prophet, but apparently he didn’t meet their expectations. Did they ever believe him to be the Christ? It is hard to know, but now with the news of his death he seems to have been just one more prophet killed for being God’s witness. When Our Lord teaches them their foolishness he makes it clear from the beginning, even though they didn’t recognize him, that he was the Christ. When they finally recognize that he is not dead, but alive, and that he is not just another prophet, but the Christ of whom the prophets foretold, a Christ who was able to conquer death itself, they are changed from dejected people walking home into disciples running to Jerusalem to share the news. What are your expectations for the Risen Lord this Easter season? He can transform a crippled life or a dejected one into a life filled with energy, hope, joy, and purpose. Place your trust in him and the results will astound you too. Readings: Acts 3:1–10; Psalm 105:1–9; Luke 24:13–35. See also Easter Sunday, Mass During the Day (2) and Easter Wednesday. Today’s readings remind us that it is the Risen Christ who helps us bridge the gap between perdition and redemption, between despair and hope. In the First Reading Peter helps his listeners realize that their sins and failings had consequences: their sins had led Christ to be crucified. However, if Christ shows them their guilt, he also presents the path to their redemption: through Baptism Christ would lead them from perdition to redemption. In a special way this week the Church prays for her new members who received the sacraments of initiation last Saturday, including Baptism, just as the repentant listeners did today, and have passed from perdition to redemption. Mary Magdelene had already been brought from perdition to redemption, but now, with her Lord missing and no way to find him or pay him one last gesture of devotion, she is in despair. Even holy souls, when they lose sight of God, run the risk of falling into despair. It is in that moment of despair that the Risen Lord comes to meet them and put them on the path of hope again. Hearing Our Lord’s voice brought Mary back from the brink of despair. What’s in your heart today? A feeling of perdition regarding how your life is going? A feeling of despair about some trial you’re undergoing? Ask the Risen Lord to come to you and help you bridge the gap. Readings: Acts 2:36–41; Psalm 33:4–5, 18–20, 22; John 20:11–18. See also Easter Tuesday. Today’s readings, as we continue the Easter octave, remind us that Easter is also a proclamation of the end of the greatest fear man has ever faced: death. In today’s First Reading Peter boldly “proclaims” that Christ has risen from the dead after everything he had endured and suffered: his enemies thought death would be a definitive solution, but not even death could contain the Christ. Mary Magdalene is described in today’s Gospel as “fearful yet overjoyed.” A horrible death has not definitively conquered her Lord; rather, in his death Our Lord has conquered death itself for all of us. The thought of this life ending some day for each one of us has captured the imagination and anxiety of mankind throughout the centuries. Some have faced it with resignation and an attitude of tragedy and drama. Others have shaken their fist at it and tried to squeeze every drop out of their life before it runs out. Christians live this life and the thought of death with hope: we know now, thanks to Christ and through Christ, that death no longer has the last word. Death is a passage to a new and wonderful life for those who believe in Christ. Let’s treat those little fears about proclaiming Christ and his victory over death as just that: shadows that should vanish in the light of Christ. Christ is truly risen and the fear of death, be it physical death or simply the death of our reputation for sharing the Good News, should no longer hold sway over us. Readings: Acts 2:14, 22–33; Psalm 16:1–2a, 5, 7–11; Matthew 28:8–15. See also Easter Monday. Today’s Gospel, recommended for celebrations on the afternoon or evening of Easter Sunday, presents a thematic continuity with the Gospel of yesterday‘s Easter Vigil. The implications of the Resurrection are continuing to “dawn” on the disciples that first Easter Sunday, and now, in the evening that day, the “dawn” spreads to the disciples on the road to Emmaus. They too did not believe the holy women’s announcement of what had happened, just like the Apostles. Things were just not turning out as they’d hoped, so they were calling it quits and heading home. Our Lord calls them foolish, but he doesn’t abandon them to their ignorance. They are not trying to interpret the events scripturally, which is a recipe for failure: how do you rationalize someone rising from the dead? You can’t fathom it through any text book or science other than the Word and science of God. God has to help the profound and amazing reality of the Resurrection “dawn” on them. Even with hearts burning they don’t recognize him until he’s vanished from their sight, but now the light of Christ has dawned on them and they too must spread the news. We have a new Easter season ahead of us. The contemplation of the Resurrection is not just for today; we have an entire liturgical season to go deeper in the mystery. Let’s spend this Easter season asking Our Lord to help understand his Word, written or otherwise, regarding the new life that has begun not only in him, but in us. This light is not just for us, but for others as well. Readings: Acts 10:34a, 37–43; Psalm 118:1–2, 16–17, 22–23; Colossians 3:1–4; Luke 24:13–35. See also Easter Sunday, Mass During the Day and Easter Wednesday.